The Big Ten entered the 2018 season with questions at quarterback from two of their bigger programs – Ohio State and Michigan. While Dwayne Haskins has been all that Buckeye fans thought he could be, Shea Patterson has turned it up recently as all eyes are now looking towards the regular-season finale between OSU and Michigan as the de facto Big Ten Championship Game. While that will likely just decide just the Big Ten East, those two are the only teams who remain undefeated in conference play at the halfway point of the season, and the winner should be the clear betting favorite to win the actual Big Ten Championship. Wide receiver K.J. Hill has had a lot to do with Ohio State’s offensive success this season and the success of his quarterback in Dwayne Haskins, leading to Hill tying for top grade among offensive players in the conference. Offense aside, the Big Ten has also seen some strong defensive performances even without the Big Ten’s most notable player on scholarship anymore. 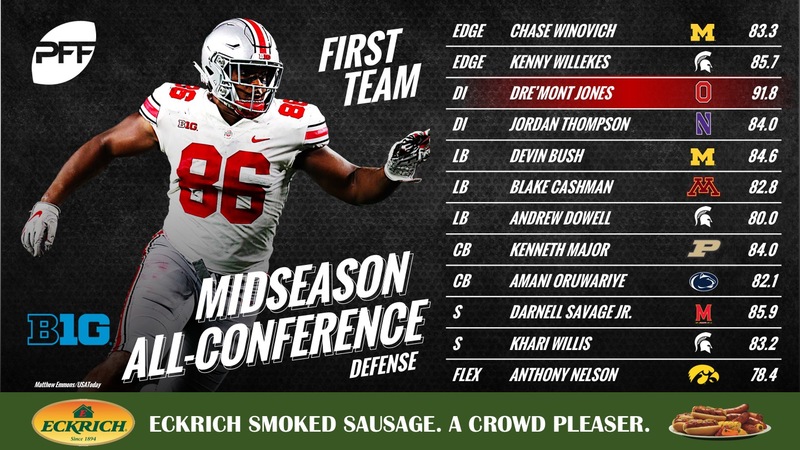 The PFF Midseason All-B1G Team is brought to you by Eckrich, the Official Smoked Sausage of the College Football Playoff. McSorley has been subjected to 17 dropped passes, a figure that led the nation and the conference at the beginning of Week 7. Still, the veteran signal-caller has found his big plays when given time but his ability to create outside of the structure has moved his grade this season. He has connected on four touchdown passes under pressure, the most in the conference. Taylor has climbed back into the Heisman race despite two tough losses from the Badgers as a team. He currently leads the conference with 942 rushing yards, 571 yards after contact and 42 combined first down and touchdown runs. Putting forth one of the stronger efforts just a week ago, Ozigbo has been a bright spot for Nebraska this season. He averages a very healthy 4.07 yards after contact per attempt as 26 of his 73 carries have either gone for a first down or a touchdown. Dominant from the slot, Hill is torching opposing secondaries after the catch this season. He currently averages 4.44 yards per route run from the slot, has gained a total of 331 yards after the catch and sees the conference’s highest passer rating when targeted at 143.9. Spielman falls in second place in overall grade and in total missed tackles forced after the catch with 11. He has racked up 390 yards after the catch and 25 of his 45 receptions have either moved the chains of scored a touchdown. A true freshman breakout star, Moore is quickly becoming a household name with David Blough at quarterback. He’s forced a conference-best 13 missed tackles, averages 8.7 yards after the catch per reception and is hauling in 78.9% of his targeted passes, the second-best mark among conference receivers with at least 25 targets. The ‘other’ Iowa tight end grabs the midseason award as Hockenson leads the conference with 384 receiving yards. He averages 7.3 yards after the catch per reception and sees the best passer rating when targeted among Big Ten tight ends (155.8). Van Lanen may have fewer snaps than the rest of the offensive linemen here, but when he’s been on, he’s been dominant. Posting the highest game grade of any offensive lineman in the conference this season, his 96.8 overall grade against Nebraska shows just how dominant he can be. Holding the conference’s best 81.1 run-blocking grade among guards, Benzschawel also has impressed in pass protection. He’s allowed just three total pressures on 151 pass-blocking snaps. Biadasz has been solid all around, allowing four pressures on 141 pass-blocking snaps but he’s more than held his own with his run-blocking. On 78 carries to either his right or left side gap, Biadasz has paved the way for a combined 25 first down or touchdown runs. In a close battle with Iowa’s Ross Reynolds, Allegretti edges the Hawkeye out with his efforts in pass protection. On 207 snaps, he’s allowed just five pressures including no sacks so far. Slater has handled his business in both run-blocking and in pass-blocking as he currently holds the conference’s second-highest overall grade. On 309 snaps in pass protection, he’s allowed just six total pressures. Winovich may only be third in terms of total QB pressures in the conference (29) but he has more than impressed in run defense. He leads all Big Ten edge defenders with 21 stops against the run. If Winovich has impressed against the run, Willekes has been a revelation. Willekes currently leads the Big Ten’s edge defenders with a 14.1% run-stop percentage while he also has recorded the second-most pressures with 32. Pick-6’s are not a commonality from interior defensive linemen but that’s not to say it can’t happen. Jones’ pick-6 in the TCU game is just one of the splash plays that he’s made this season as he’s been dominant from the interior. He has a conference-leading 18 QB pressures that include five sacks and four QB hits. Certainly less heralded than some of the interior defensive linemen in the conference, Thompson has limited mistakes and made plays when called upon. On 167 pass-rushes, he’s brought in 10 pressures while he’s also made eight stops. Bush has certainly been one of the better blitzing linebackers across the nation and this season is no different. He currently has 13 total pressures on just 44 pass-rushing snaps and when he drops back in coverage, has allowed just 44 yards despite 17 targets as the primary coverage defender. Cashman is second among Big Ten linebackers with 26 defensive stops as he’s also had success as a blitzing linebacker as well. He’s brought in six pressures that include two sacks and a QB hit. Much like his counterparts here, Dowell has had a strong start to the season in coverage and when rushing the passer. On just 18 pass-rush snaps, he’s been able to record six pressures and he’s limited receivers in his coverage to just 4.1 yards after the catch per reception allowed. Major has allowed just 37.5% of the passes thrown his way to be caught, the second-best figure among Big Ten cornerbacks with at least 20 targeted passes. In total, he’s intercepted three, broken up another two and limited opposing quarterbacks to a 10.8 passer rating on throws into his coverage. Holding the conference’s second-highest coverage grade at the position, Oruwariye has been the second-most targeted corner in the conference. Despite allowing four touchdowns, he’s still intercepted two and broken up eight more to tie for the conference lead with 10 plays on the ball. The play on his last name is certainly applicable here: He has been savage against opposing passing offenses this season. On 22 targets as the primary defender, he’s allowed just 10 receptions for 73 yards, 26 after the catch, and intercepted four passes. All told, Savage has allowed a 14.2 passer rating on throws into his coverage. Willis certainly gets the nod for Mr. Dependable here. He’s hauled in six total plays on the ball (2 INT, 4 PBU) and recorded 10 defense stops while missing just three tackles on 38 total attempts. Since Week 4, Willis has not put forth a game grade lower than 73.2 and made our Big Ten Team of the Week three times. Typically reserved for an extra coverage defender, Nelson’s impressive play from the edge is more than enough to nab a spot on this team at our Flex Defense role. He’s recorded 22 QB pressures, 13 defensive stops and done so all without missing a single tackle attempt.